Jose Mourinho is a manager who will forever cause debate between fans. Some say that he’s one of the greatest managers football has seen (his trophy cabinet would suggest so) while others just can’t stand him and disapproves of his style of football as well as his confrontational personality. His tactics have often been described as negative and defensive, while others say he’s simply pragmatic and does what he needs in order to win. No one can deny the fact Jose Mourinho is a winner; he’s won the league title in Portugal, England, Italy and Spain as well as the Champions League with both Porto and Inter. Even in his first year at Old Trafford as Manchester United manager, when United finished sixth in the league, brought two trophies in the shape of the League Cup and Europa League successes. What causes the debate is his confrontation-seeking public appearance and his style of football. In England in particular, the term “Mourinho tactical masterclass” has been used whenever he’s set up one of his sides to nullify the opposition’s attacking strengths, keep a clean sheet and score the winning goal from a set-piece or a counter-attack. There are plenty of examples; the 2-0 win at Liverpool which ended their title hopes in 2014 when at least six of Mourinho’s players hardly ever stepped ahead of the ball or the 1-0 win at Manchester City in the same year. Mourinho’s approach has made him one of the most successful managers ever so it’s hard to argue with his record. However, as football evolves and coaches and teams become better and more knowledgeable of their opponents in particular, Mourinho runs the risk of being left behind. He still organizes a defence better than most. Mourinho’s United has only conceded five goals in the Premier League in their first eleven matches but they’ve also only scored two goals in their last four league games. The problem can therefore easily be identified; can Mourinho still coach an effective attack? Before analysing United’s attacking shortcomings this season, we must remember Mourinho’s Porto, Chelsea, Inter and Real Madrid were mostly very effective going forward; his Real Madrid even outscored Pep Guardiola’s Barcelona twice in the three seasons the two went up against each other in Spain. The problem for Mourinho is that the game has evolved so much that his original attacking template can’t be applied effectively any longer. Just as structured and organised Mourinho’s defensive systems are, just as free and un-structured are his attacking systems. Attackers are mostly given free reign in terms of creating chances and running the attacking play. With the best players, such as at Real Madrid, this was clearly very effective as they scored as much as they did, but they are also a unique case given their quality in relation to most of their opposition. Eden Hazard touched on this in an interview with Sky Sports when asked to name the difference between Antonio Conte and Jose Mourinho. Hazard’s claim support the general feeling that Mourinho largely leaves his attacking play with his players compared to Conte who actively coaches an attacking style of play as well as a defensive. This can be seen in the way United have played recently when forced to break down opponents when compared with his colleague at the neighbors across Manchester. The problem of Mourinho’s lack of attacking structure has been seen recently in forgettable performances against Liverpool, Huddersfield and Chelsea which yielded a solitary point and a single goal scored. The problem is simple; Mourinho’s approach to attacking play hinges on his players to actively solve problems on the pitch, open up deep-blocks and create chances through simply their individual quality and creativity. Players like Paul Pogba are therefore absolutely vital as he can always create something out of nothing using his dribbling, passing or shooting ability. Pogba’s absence has been clear to see given the fact United scored 3 goals per game on average with him compared to 1.5 goals on average without him. The approach also means young and inconsistent players like Marcus Rashford and Anthony Martial have to deliver creative solutions without the support of a well-structured system such as at Manchester City where similar players like Raheem Sterling and Leroy Sane thrives. Most of United’s goals this season has also been scored late in the game with counter-attacks as the opponents were chasing the game, this is a facet of Mourinho’s approach that he still knows how to coach effectively and which fits perfectly with his successful defensive setup. In the two videos below I take a look at United’s struggles at Huddersfield. The lack of attacking structure is surreal where EIGHT players occasionally drop as deep as in front of Huddersfield’s midfield leaving Romelu Lukaku completely isolated up front. Pause the video when the text appears as it might disappear quicker than you realise. There seems to be no structure to the attack, the players seem to move freely in whatever way they want which harms the team. When sides defend deep and compact against United the attacking players will grow restless and come deep to get the ball. That creates the ridiculous sequences as we saw in those clips above. With a clear structure on how to progress the ball forward, those players would have stayed in their correct positions and given their teammates options to pass the ball forward. If eight United players gather in front of the oppositions midfield with one wide and Lukaku alone up front, there is no one to receive passes. Also, the opposition never has to react to passes going in between them which can disturb even the most solid defences. United don’t create enough horizontal lines in their attacking shape to successfully progress the ball forward against a compact opponent. There is no order to the attack but instead always a flux of chaos. Their 4-2-3-1 formation should theoretically create at least four horizontal lines; the 4, the 2, the 3 and the 1. Given most teams defend with three lines, an attacking shape with four lines creates players between the lines of the oppositions. That type of positioning is the biggest problem for compact teams as a receiver between two lines creates a problem for the opposition in regards to who presses the player in possession. Given United’s lack of players between the lines, their opponents never has to deal with these problems. For inspiration on creating multiple horizontal lines in their attacking shape, Mourinho could do worse than look at his neighbour across town. Manchester City’s approach under Pep Guardiola with his positional play is clearly vastly different from Mourinho’s approach but the multiple lines in their attacking shape is something he can look at. City display the benefits of different horizontal lines in their setup below as they create four horizontal lines in their shape. The first line is the back three building the play against the two strikers. Note, three defenders against two strikers, not four plus two midfielders against a lone forward as United did. The second line is the two central midfielders in between the opposition midfield and strikers. The third line is the two attacking midfielders in between the opposition’s defence and midfield and the fourth line is the three attackers pushed up against the opponents back four to create space for the attacking midfielders. Each line has a purpose, the back three need to beat the first line of pressure, the second line looks to receive passes and attract pressure from the opposition’s midfield which increases the space for the two attacking midfielders. Their space becomes even bigger considering the front three’s high positioning which forces the back four deeper. Another plus with multiple lines is when there is a need to go back with the ball following a forward pass. If United’s defenders would pass the ball to a forward player who would be pressed and forced to go back, that pass would again go back to the defenders or the central midfielders and the entire defensive team would be yet to break through. If City find a pass from their first line (the defenders) to the third line (the attacking midfielders), the ball can still go back to players in the second line (central midfielders) and they would still be in between the lines of the opposition’s defensive block. This attracts pressure and they could then progress the play beyond the opponent’s midfield line to their attacking midfielders. 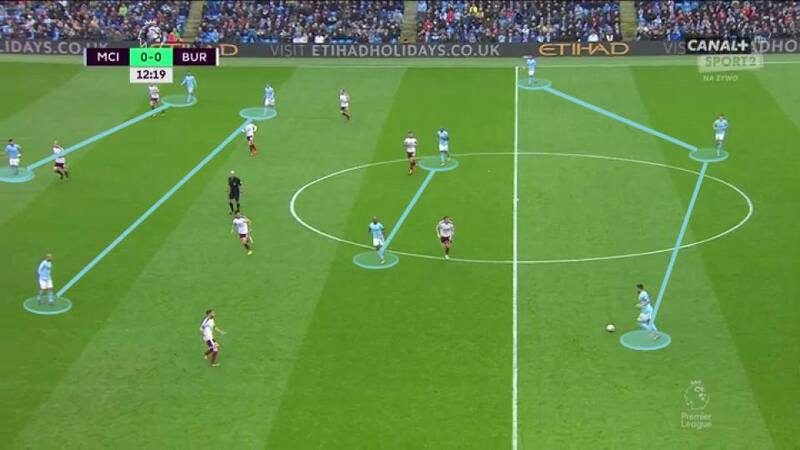 A back pass for United means they have to start over, but for City it keeps the attack going. Below is an example of their movement and how they use their positioning to break through. Mourinho needs to adapt his approach to attacking play. The direct, long balls to Marouane Fellaini is very effective. But there is no point throwing away 75 minutes of games before introducing the big Belgian, pumping balls forward and hope his presence in the box causes enough trouble for the opposition to create a goal. That can still be a plan B, but given the players at his disposal Mourinho needs to create a plan A. It seems Jose Mourinho alone can’t fix this problem. If he could, he would obviously had done so by now since it looked like this last season too. I would suggest United employ an assistant coach who knows how to effectively coach an attacking structure. It doesn’t have to be like City’s, in truth it can’t, but something needs to change because if Pogba isn’t playing out-of-this-world stuff for the rest of this season United will struggle to break teams down. In big games, like against Tottenham, Mourinho’s defence first and then counter-attack approach can still work. Sir Alex Ferguson kept evolving by changing his back-room staff and kept himself at the top. Mourinho struggles to keep up with modern coaches by now and despite a very good set of attacking players the attacking play is poor. The right assistant can help unlock so much potential out of United’s players when going forward. Manchester United are second in the Premier League. Given Manchester City’s form this season that is no disaster. The fear is that their football will see them struggle to keep up with City but also find themselves fighting to even clinch a Champions League spot if the current form continues. Injury returns from Pogba and Zlatan Ibrahimovic and their naturally creative individual contributions will help a lot given the reliance on individuals in United’s attacking play, but it won’t be enough to keep up with City. To improve further and stop blaming circumstances out of their control (referees, injuries etc) Mourinho needs to create an effective attacking play. He doesn’t seem capable of doing this so he needs an assistant to help him out. An effective attack combined with Mourinho’s superb defensive structure and rapid attacking transitions would make United a considerable force in England as well as Europe. The best coaches can get their team to play in different styles depending on the opposition and the players at hand. If Mourinho still is one of the top coaches he fixes this problem immediately. If not United, never mind himself, risks being left behind.